ANN ARBOR—Despite concerns about Detroit’s bankruptcy, 56 percent of local government officials in Michigan said it was the right thing to do, according to a poll by the University of Michigan’s Ford School of Public Policy. More than half of local leaders said the bankruptcy would hurt the state’s reputation, 43 percent expected costs to rise for other local governments to borrow money, and 32 percent predicted a negative impact on tourism in the state. 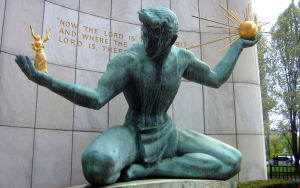 In July 2013, the city of Detroit filed the largest municipal bankruptcy in U.S. history. “We’ve never known before how local government leaders, overall, evaluate the difficult tradeoffs inherent in bankruptcy proceedings. Who should feel the pain first? Who should be protected?” said Tom Ivacko, administrator and program manager for the Ford School’s Center for Local, State, and Urban Policy. “This survey is a first-of-its-kind window into these values and priorities of our local leaders,” he said. Top cost-cutting strategies a jurisdiction should pursue during bankruptcy include increasing service sharing agreements with neighboring jurisdictions (79 percent), cutting or privatizing services (64 percent), raising revenue by selling assets (62 percent), and cutting compensation (pay and/or fringe benefits) for current employees (58 percent). 51 percent of local leaders think that cuts to current retirees’ pensions should not be pursued during bankruptcy. Overall, 65 percent of Michigan’s local leaders said Detroit’s fiscal health is important to the state of Michigan’s overall fiscal health. “From the southeast corner to the far reaches of the U.P., majorities of local leaders think Detroit’s fiscal health is vital to Michigan’s future,” Ivacko said. The study, conducted Oct. 7—Dec. 17, 2013, involved surveys sent via hardcopy and the Internet to top elected and appointed officials in all municipalities in Michigan. A total of 1,353 jurisdictions returned valid surveys, resulting in a 73-percent response rate. The survey had a margin of error of 1.4 percentage points either way.